• Stuart Young has been reassigned from minister in the ministry of the attorney general and legal affairs and minister of state in the office of the prime minister to minister in the ministry of the attorney general and legal affairs and minister in the office of the prime minister. 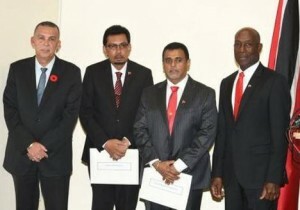 Newly-appointed works and transport minister Rohan Sinanan said he is humbled by the confidence placed in him by Rowley “to run one of the largest ministries at a time when the country needs the ministry of works to get going”. Sinanan, a deputy political leader of the People’s National Movement (PNM), admitted his new ministerial responsibilities would be a challenge. He said he planned to give it his all and would “scrutinise the award of contracts” given questions raised under the former administration. Following Monday’s official announcement of Sinanan’s appointment, a story published in December last year started recirculating on social media about a 50th birthday party at his Valsayn home that was attended by Rowley, the Trinidad Guardian reported. Among the guests were Jack Warner and businessman Ishwar Galbaransingh, both of whom are currently challenging extradition request by US authorities. In the case of Khan, while this is the first time he has been appointed energy minister, he is no stranger to the sector. “I am a petroleum geologist and I worked for over two decades in the industry, so that is my professional training. I intend to bring my expertise to bear on the ministry of energy,” he said. Meanwhile, opposition leader Kamla Persad-Bissessar questioned why the attorney general and the ministers of health, education and national security were not changed in Monday’s reshuffle. “They have been colossal failures in their respective portfolios and have yet escaped being removed. A cloud remains over the head of attorney general (Faris) Al-Rawi for his handling of the Malcolm Jones and other fiascos,” Persad-Bissessar said in a release. “This is a classic case of reshuffling bush cards. It is now apparent that Dr Rowley does not have a team of competent, knowledgeable and experienced professionals from whom to select Cabinet Ministers. Suitably qualified professionals clearly do not want to be a part of the failing Rowley regime,” she added. “The country has previously seen Franklin Khan at work and has not been impressed by his performance. His promotion to the critical ministry of energy and energy affairs does not provide any comfort of visionary leadership to improve the activities in this vital sector,” Persad-Bissessar said. “The removal of Fitzgerald Hinds as minister of works was anticipated in light of the absence of any infrastructural works in the first 13 months of the Rowley regime. His replacement, Rohan Sinanan, has been handed a major ministerial plum without any proper experience in public service,” she said.